My traditional pre-holiday reading was focussed on the extreme summer heat and not just how I was going to cope but also how the Iranians manage year after year during the seeringly hot summer months when temperatures can soar over 40 degrees centigrade in many areas. Inevitably, much of my research concerned water consumption and distribution in regions where much of the land is arid or semi-arid and how crops are grown in rural areas without regular rainfall. Was I going to be eating the luscious melons that Esfahan is so famous for or would they all be withered up left to dry out in the fields? I also wondered whether we would be subject to water rationing at home and, heaven forbid, would there be a ban on hosepipes? It was when reading about these problems that I came across an ingenious solution to water distribution, the Qanat system. This underground aqueduct system is known to have been developed by the Persians sometime early in the 1st millennium BC, around the same time that we Britons were fighting off the Roman invasion led by Julius Caesar. Qanats were subsequently adopted by Arab and African countries further West and the remains of Qanats can still be found in China, Pakistan, Syria, UAE, Algeria, Greece and Spain. So what is a Qanat? 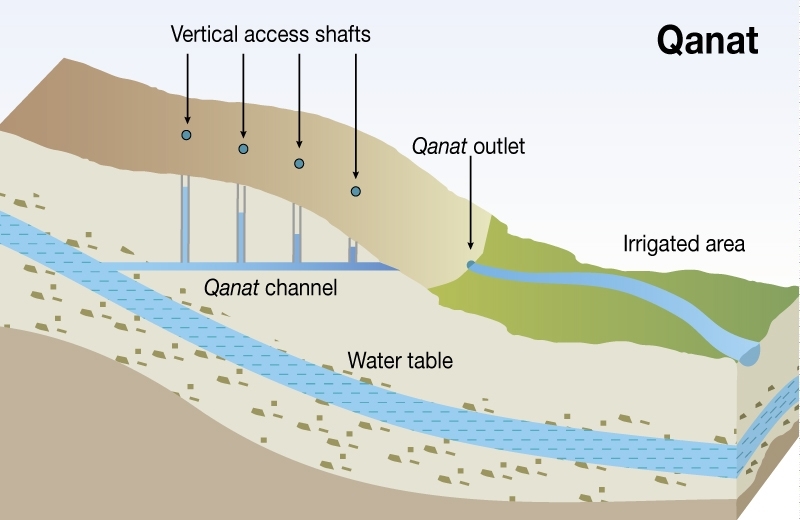 Simply, a Qanat is a series of shafts connecting ground level to sloping tunnels below ground. The theory is that the Qanats tap into the water underground so that it brings large quantities of water to the surface up the shafts without the need for a pumping mechanism. The water drains by gravity as it flows downwards from the aquifer source towards its destination. Because the canals are underground, there is little or no evaporation or wasteage and contamination is kept to a minimum. Qanats are usually contructed to cover a large area/distance which means that many fields and homes can be kept watered. Qanats were both expensive and time-consuming to build but it was considered a major investment by the communities who needed reliable water supplies for many years to come. That initial investment must have repaid them many-fold and the Qanats are a wonderful legacy. Building the Qanats is a skilled occupation and knowledge was generally passed through families from father to son. The gradient of the Qanat has to be just right if it is to be successful. Too shallow and the water will not flow; too steep and the heavy flow of water is likely to collapse the Qanat by washing it away. Bearing in mind that these shafts and tunnels were excavated by hand, without the sophisticated machinery we have today, they are amazing to see. If the Qanat diggers were lucky, they would initially hit the water aquifer at 50ft. Unfortunately for the labourers many of the shafts are 200-300 feet deep. Most Qanats are between 8-10 miles long with the longest Qanat in Iran being 18 miles long. “In Persia, blind white fish live in the qanats.” This statement led four Oxford undergraduates to Iran in the early 1950’s to look for a new species of fish which apparently lived in the qanat water system and a book detailing their travels and exploits can still be found in secondhand bookshops. 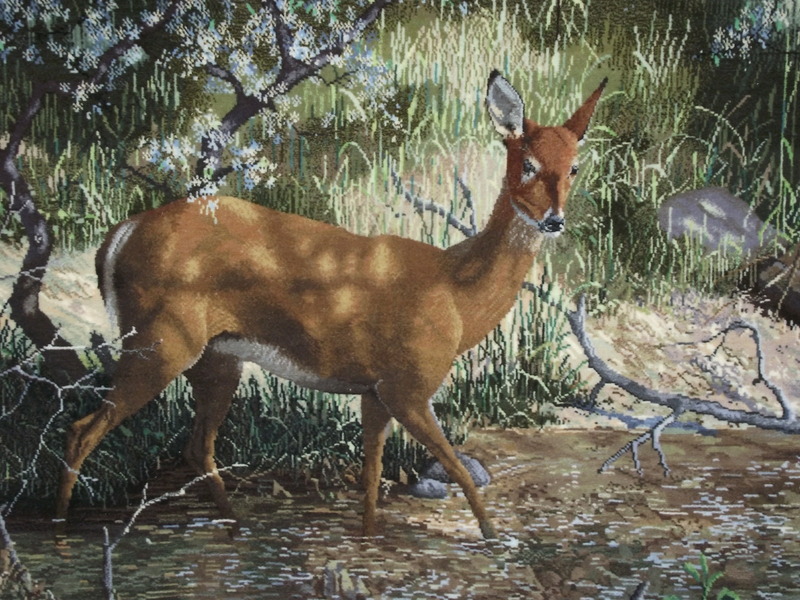 Keep an eye out for “Blind white fish in Persia” by Anthony Smith. It is well worth a read. 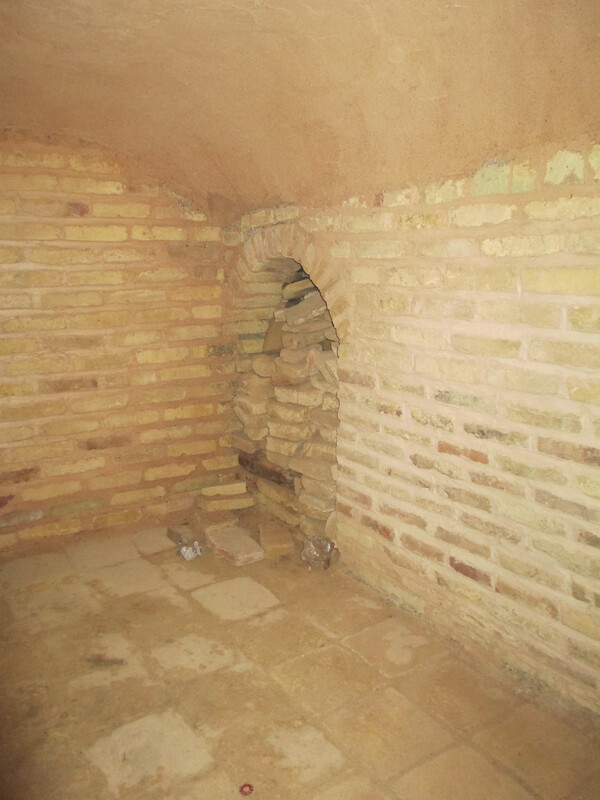 The Old Mosque in Na’in has a Qanat in the underground chambers although it is no longer in use. When it was used, it carried water for 1.2km to the left of the town and 1.5 km to the right thus serving much of the community around. 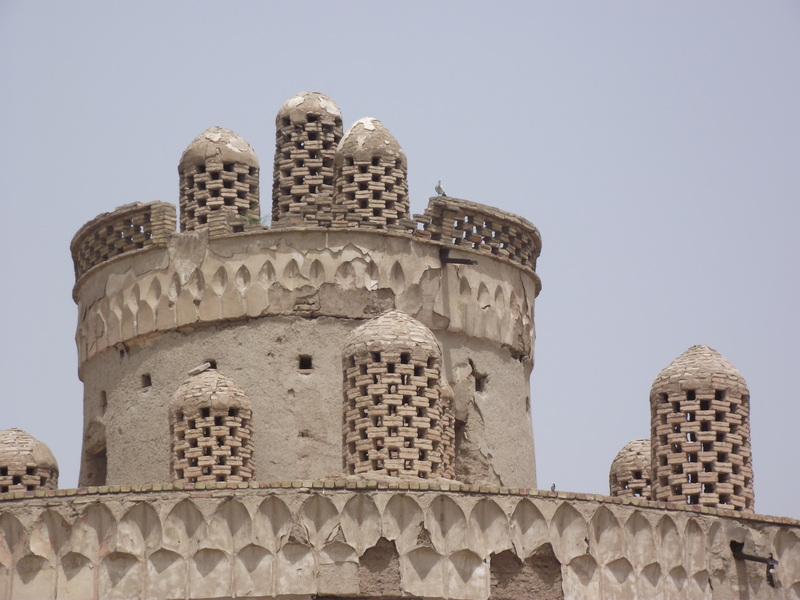 Qanats are often used in conjunction with wind towers (Badgirs) and Yakhchals (ice houses) which are separate above-ground structures combining to cool air and water-an early version of air-conditioning and refrigeration and not a watt of electricity in sight. Perhaps these ideas can be adapted for future use as more sustainable options. Compared to some of the elaborately decorated and colourful mosques I have visited in Iran, being one of the four oldest mosques in the country, the Congregational Mosque in Na’in is no less beautiful for its simplicity of design and clean lines shown to perfection against the clear blue sky. The oldest part of the mosque dates from the 7th Century with the remainder built in the 10th/11th Centuries. Spectacular both inside and out, some of the internal features were real highlights for me and it was amazing to find that they lived up to their descriptions in the guide books. I had read about the famous minbar [an elevated pulpit from where the Imam stands to deliver his sermons] and so firstly made my way towards it only to find that was partially screened off which restricted viewing. I could still see however that it is a magnificent example of a minbar. Standing 5m high and intricately pieced together from wooden marquetry, it is 700 years old and the most valuable minbar in the Esfahan region – hence the extra protection. 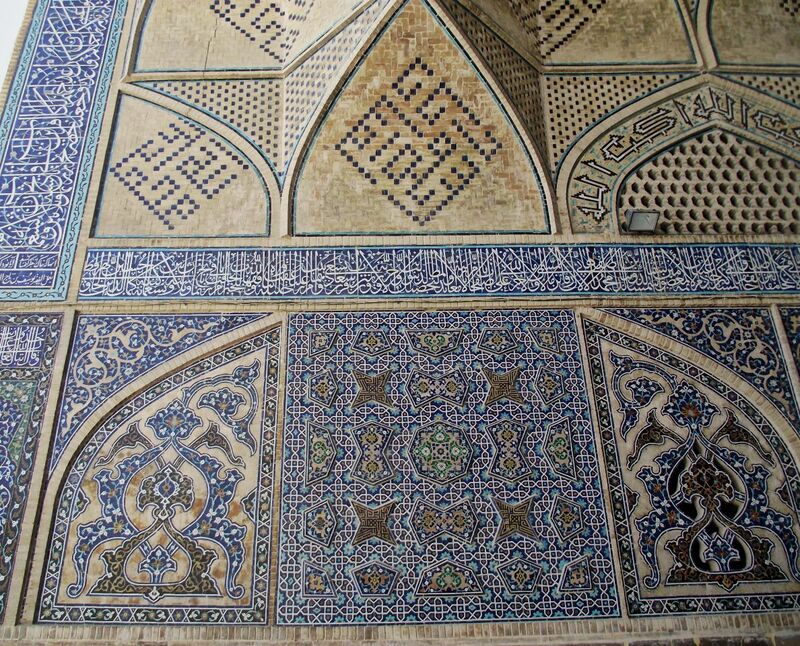 Another common feature of Persian mosques is the finely carved stucco which decorates the mihrab and columns. The Congregational mosque has a beautiful stucco mihrab which is the traditional semi-circular niche in the wall of the mosque directing Muslims to face Mecca when praying. These unique carvings are echoed on the fourteen surrounding columns making this part of the mosque the most ornate. 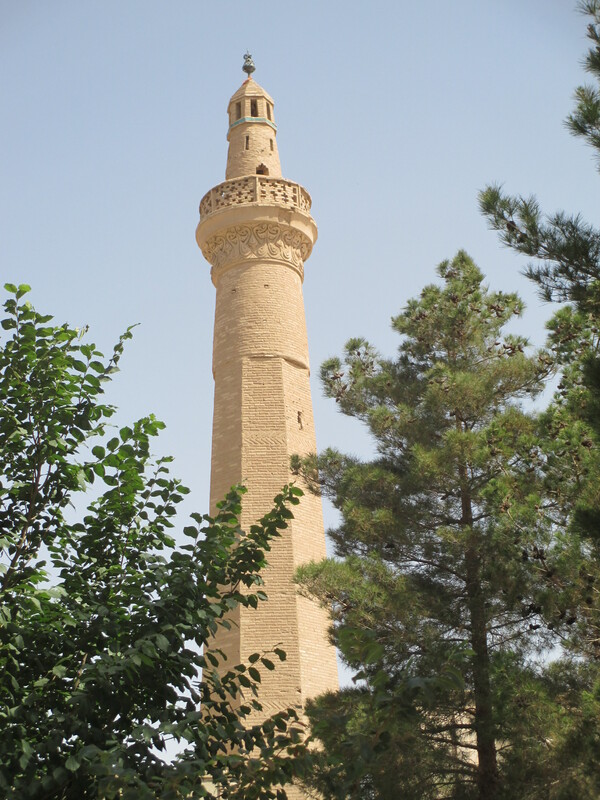 The minaret at the Southeast corner, which led us to the mosque when approaching the town, is most unusual. It is 28m high and can be seen from miles around. 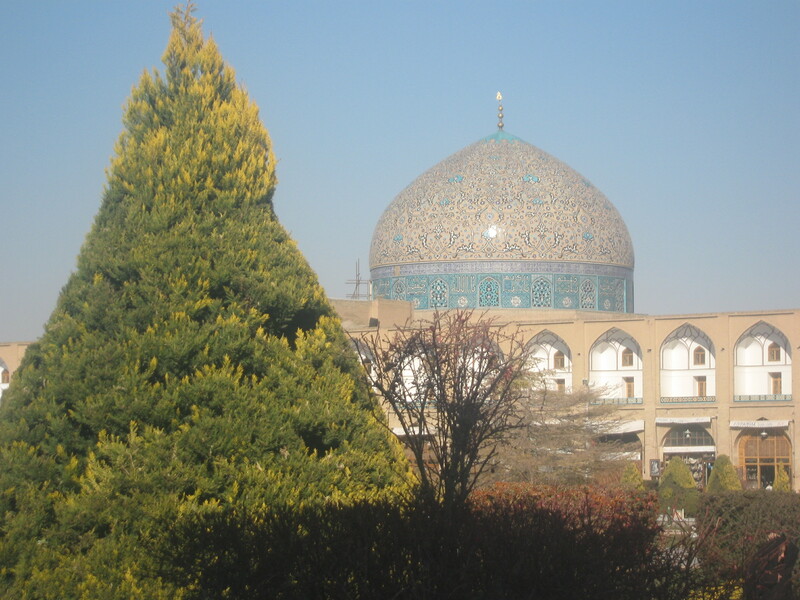 It is also octagonal, a feature which makes it completely different from any other minaret found in the Esfahan area. We were now entering the hottest part of the day, and with travelling East to the edge of desert country the temperature was rising steadily to 40 degrees +. Although we were walking slowly around the stone built building and being comparatively cool compared to out in the open, it was still very hot. I was very thankful therefore when Mr Aghaee, our impromptu guide, told us about the underground prayer hall and qanats which were much cooler. Mr Aghaee proceeded to take us down two flights of stone steps leading to the Prayer Hall. He told us that the Prayer Hall remains at a constant temperature throughout the year only fluctuating 10-15 degrees even in the hottest and coldest times of year and is mostly used during high summer and mid winter when temperatures are at their least comfortable. It was a relief to escape from the oppressive heat upstairs and I could see why this area would be popular. The Prayer Hall wasn’t built or constructed but was simply dug out of the ground together with a maze of passages and small recesses also carved out beneath the mosque’s ground floor. The underground accommodation has no electric lighting, but is cleverly lit by five marble panels placed in the floor of the mosque which refract the daylight down “lampshades” made of stone. The effect is curious and can be seen in its full glory when a picture is taken with the subjects standing directly beneath one of the panels. Mr Aghaee kindly took our photos to illustrate the lighting arrangement and we could then see clearly what he meant. He knows exactly where best to stand and take the photo for best effect and we are very grateful for his inside knowledge. Some of the recesses or alcoves are used for meditation and in the absence of interested visitors like us, I could understand why. Quiet, calm and comforting, the chambers are the perfect place to seek peace and tranquillity alone with your own thoughts. One of the main reasons I wanted to visit the area of Na’in was to see and learn more about the qanat water system that originated in Iran and for someone who is avidly interested in how things work, I was fascinated by this concept. I am no engineer, but even I understand how the system is meant to carry water near and far in a country of massive desert areas knowing that there are still some working examples I was determined to seek them out. 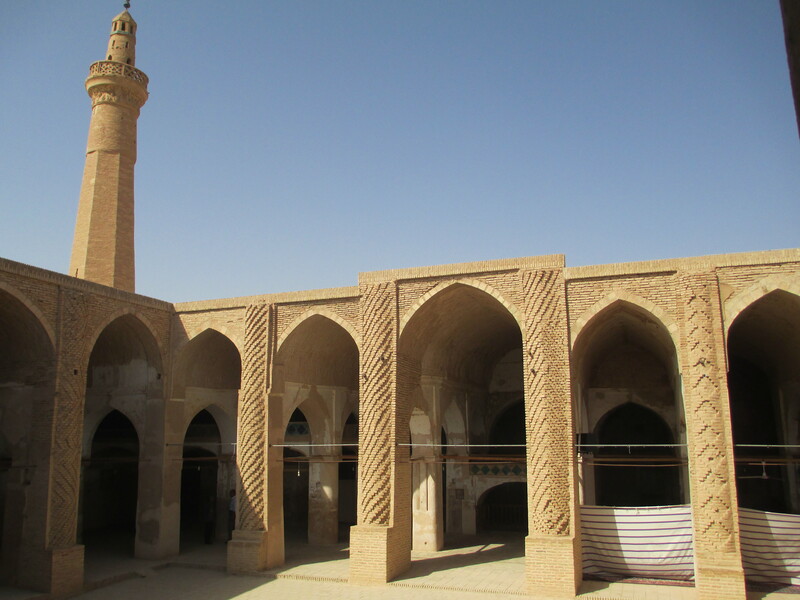 Luckily for me, the Old Mosque in Na’in has a qanat in it’s underground area, although today it is non-working, and again Mr Aghaee agreed to show us around the underground water tunnel and share his local knowledge. 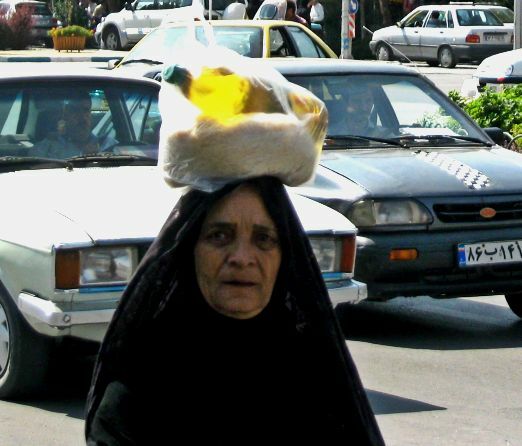 The Armenian Christian sector of Esfahan is still a thriving community albeit much depleted from the mid-1960’s when the population reached approximately 100,000. Not many people realise that a Christian area exists in the predominantly Muslim city and it is in the section known as Julfa south of the Zayande Rud river that you will find the 13 remaining churches out of the original 30 or so. Cathedrals and Mosques do go together despite what many people believe. Only yesterday I was talking about my Iranian adventures when someone asked if Westerners are still allowed into Iran and he was surprised when I explained that although I didn’t see many Westerners where I went, I have no problems whatsoever in entering the country and in fact, am welcomed wherever I go. Such is the lack of understanding and power of adverse media coverage that many people have completely the wrong idea of the situation in Iran which I find very sad. The All Saviour’s (Vank) Cathedral is spectacular and an amazing visual feast of religious murals, gold decor and superb architecture together with a selection of ancient artefacts and historical information in the Cathedral museum. In the midst of all the family celebrations and visiting relatives it was lovely to find a haven of peace and serenity in the almost deserted church and its grounds and I could have spent hours sitting on a bench looking at the frescos and murals trying to take in the exquisite detail. The museum is fascinating but sadly no photos are allowed and postcards and guidebooks of the cathedral and exhibits are almost non-existent. I did however manage to take some pictures of the external features and I found a photo DVD (Studio Par) with some beautiful images of the popular scenes.